Safety Briefings, Demos and Events: 50% Discount for ALI’s “Lifting It Right” Course. 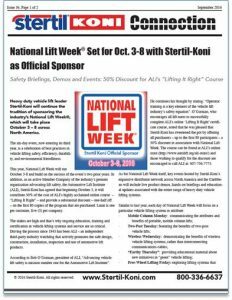 Heavy duty vehicle lift leader Stertil-Koni will continue the tradition of sponsoring the industry’s National Lift Week®, which will take place October 3 – 8 across North America. Click to read the September, 2016 issue of Stertil-Koni Connection.